They do say that teachers learn as much from their students as vice versa. Well, this all began with an image posted on Twitter by Aymenn Jawad. I’d never come across the Seringapatam Medal before, but when I read more about it, it reminded me of Greek and Roman coins I’ve studied in the past: small discs of metal which, partly because they are so small and the messages they carry so concentrated, can convey a huge amount about the historical context that produced them. The medal commemorated the storming of the island city of Seringapatam (more correctly known as Srirangapatna) by the forces of the British East India Company and their allies in 1799. Seringapatam was the capital of Tipu Sultan, ruler of Mysore, and its capture ended the reign, and the life, of an Indian ruler who had been a thorn in the side of the British for some time. What caught my interest most about this medal was the writing on it, which I think is extremely clever, but also very revealing about Tipu, and about the difficulties the British faced in India at the close of the eighteenth century. I’ll try in what follows to explain what I mean, but let’s start off with the design. 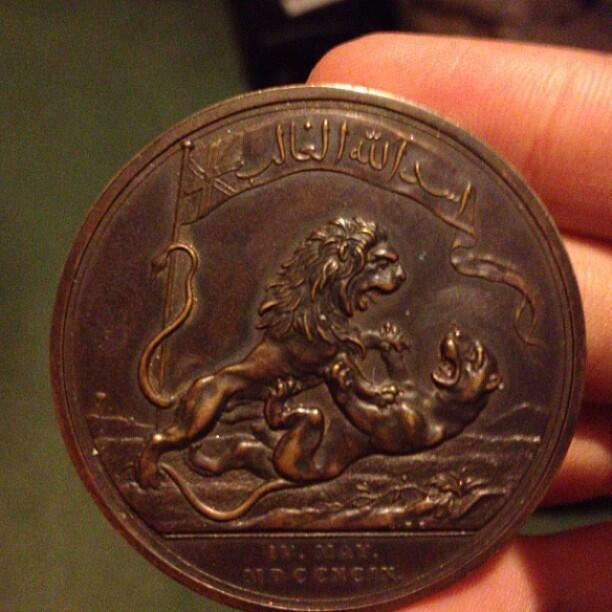 On the obverse (the first image) there’s a lion overcoming a tiger, the lion’s tail wrapped around a penant with a Union Jack and some text in Arabic, اسد الله الغالب, asadullah al-ghalib, “The triumphant lion of God.” In the exergue of this side of the medal, a Latin date, IV MAY. MDCCXCIX, 4th May 1799, the day of the capture of Seringapatam. Nothing… can have exceeded what was done on the night of the 4th. Scarcely a house in the town was left unplundered, and I understand that in camp jewels of the greatest value, bars of gold, etc. etc., have been offered for sale in the bazaars of the army by our soldiers, sepoys, and followers. I came in to take the command on the morning of the 5th, and by the greatest exertion, by hanging, flogging etc. etc., in the course of that day, I restored order among the troops, and I hope I have gained the confidence of the people. They are returning to their houses and beginning again to follow their occupations, but the property of everyone is gone. The overt message of this medal is clear enough. Tipu Sultan was very keen on tigers: tigers decorated his furniture and his firearms, like this cannon at Powis Castle; tiger stripes featured in the decor of his palaces, and his troops wore tiger-stripe uniforms (on the right of this painting); he even had tiger watermarks in his books (my thanks to Ursula Sims-Williams for that beautiful image). 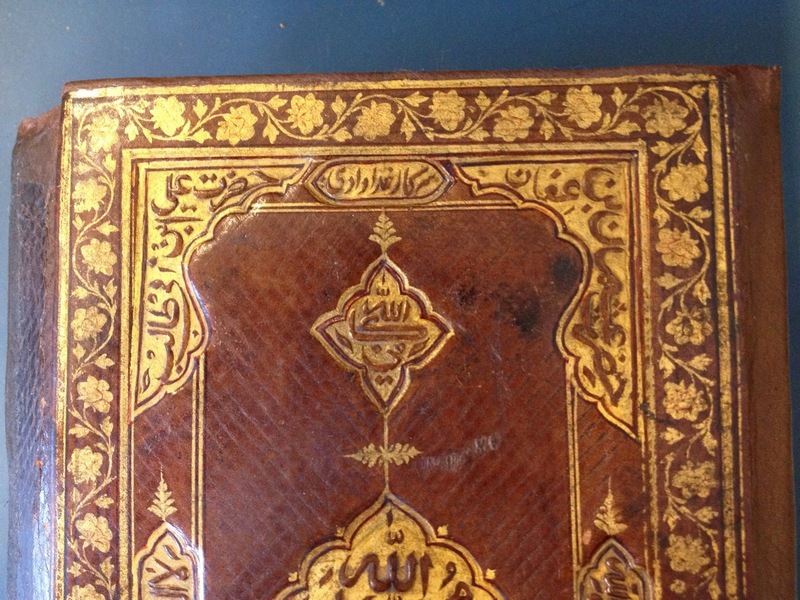 Here Bonhams publicise some gorgeous Tipu items at an auction, tigers prominently to the fore. frequently amused himself with a sight of this emblematical triumph of the Khodadad over the English Circar [or Sircar: government/authority]… It is imagined that this characteristic memoreal… of Tippoo Sultaun may be thought deserving of a place in the Tower of London. Tippoo called his dominions the Sircar e Khodadad or god-given Sircar. 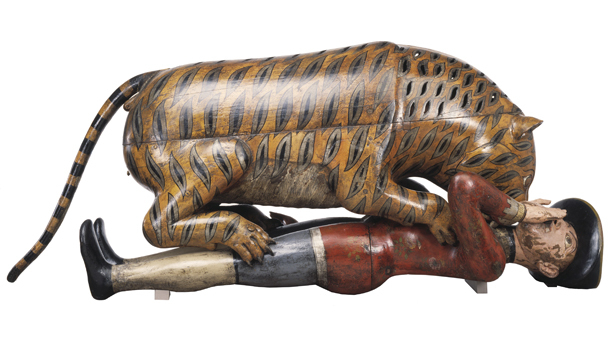 Tipu’s Tiger is now in the Victoria and Albert Museum, and there’s lots of interesting information about it on the V&A website. But what’s obvious enough is that the tiger was Tipu’s special emblem. As the “Tiger of Mysore”, Tipu could present himself both as a courageous and powerful Muslim sultan (the tiger being an age-old symbol of Persian royalty), and as a figure that also appealed to his many Hindu subjects through the tiger’s associations with the god Shiva. 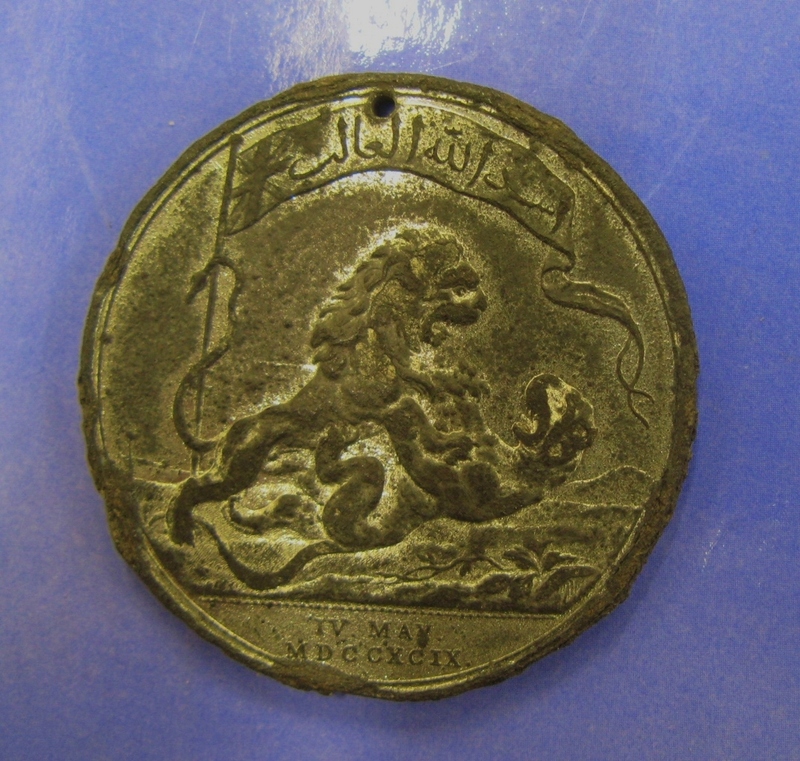 On the medal, of course, the tables are turned, and a British lion overcomes Tipu’s tiger. The penant above the two big cats drives the point home. Alongside the Union Jack, the message: the lion of God is triumphant. Asadullah al-ghalib was a name of Imam ‘Ali, the cousin and son-in-law of the Prophet who is especially celebrated by Shi’a Muslims: Tipu trod a fine line between Shi’a and Sunni Islam, as well as keeping his Hindu subjects on-side. But when the British claim to be the “triumphant lion of Allah”, they’re using his own words against him. But again the British medal turns Tipu’s own words against him: Allah showed his true favour by taking Seringapatam away from Tipu, and giving it to the deserving British. 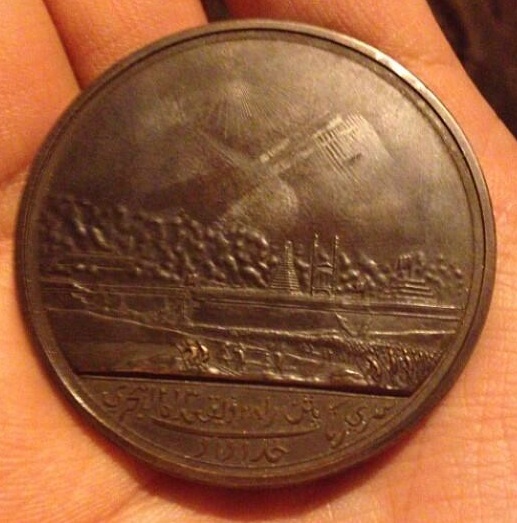 What I find fascinating about this medal design is how far Tipu Sultan, dead and buried, continues to set its terms. 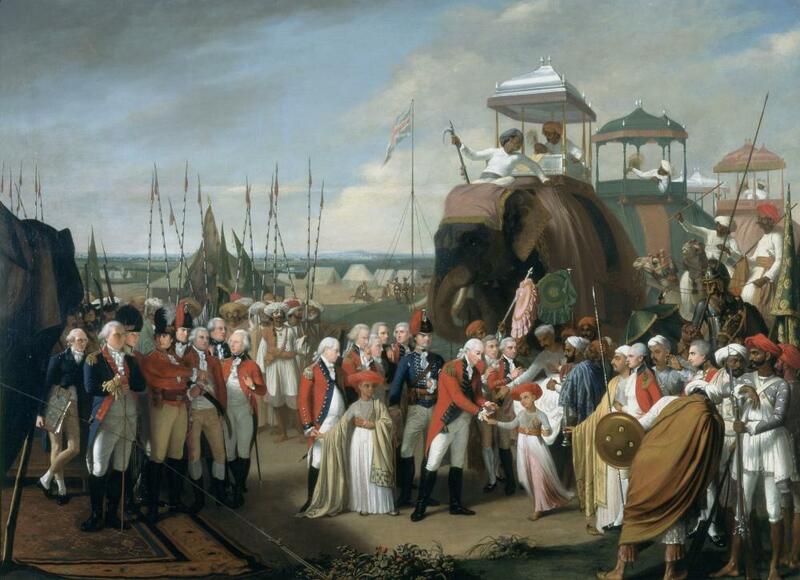 The symbolic argument of the medal, particularly as it’s made in the Arabic and Persian texts, presents the capture of Seringapatam in pointedly Islamic terms, in language and thought: the British are doing Allah’s work, and this in itself suggests how fragile Britain’s position in India was in 1799, thoroughly dependent on Indian allies and Indian manpower in its armies. It’s important to realise that the most important targets of the messages of this medal were Indian, not British. But what the medal also conveys is what an incredibly potent propagandist Tipu had been. We know that Sir Charles Wilkins was closely involved in designing the medal, and it’s certainly Wilkins, the first Englishman to master Sanskrit (an achievement which assumes, in eighteenth-century India, complete fluency in Persian), who will have provided the Arabic and Persian text. He did a good job, too: it’s a witty and in one sense devastating contradiction of Tipu’s claim to authority. And the fact a British medal marking a famous victory speaks Tipu’s language tells us that just as clearly. I’ve read some quite fascinating stuff on Tipu over the last week,and I particularly recommend A. Buddle, The Tiger and the Thistle: Tipu Sultan and the Scots in India; S. Stronge, Tipu’s Tigers; and M. Archer, C. Rowell & R Skelton, Treasures from India: The Clive Collection at Powis Castle. Arezou Azad seemed to find the medal as interesting as I did, and you should all buy her book, too. And thank you, Aymenn. Very well written. But I do agree with Dalrymple’s comparison of the events leading to the Seringapatam war and the recent one in Iraq. They are eerily similar. Thanks for these. I’m always a bit resistant to “history repeating”: it’s used to death in relation to Afghanistan, & I don’t think it really helps (or that it’s entirely true). But we can differ on that one! All best, and congratulations on your excellent blog. And this particular point that you made is extremely important: ‘It’s important to realise that the most important targets of the messages of this medal were Indian, not British’. Sharpe’s Tiger, by Bernard Cornwell is another account of the fall of Seringapatam. If you’d like to see some big guns associated with Tipu, grab the link! That tiger mortar’s very sweet. If a mortar can be sweet. Many thanks indeed!